The European Union has made digital progress one of its priorities. Heads of State met last month in Tallinn, Estonia for a summit on technological change and the challenges it poses for Europe. But behind the digital world lie a variety of issues. While it does represent economic growth and innovation, it also raises questions about security and freedom of expression. 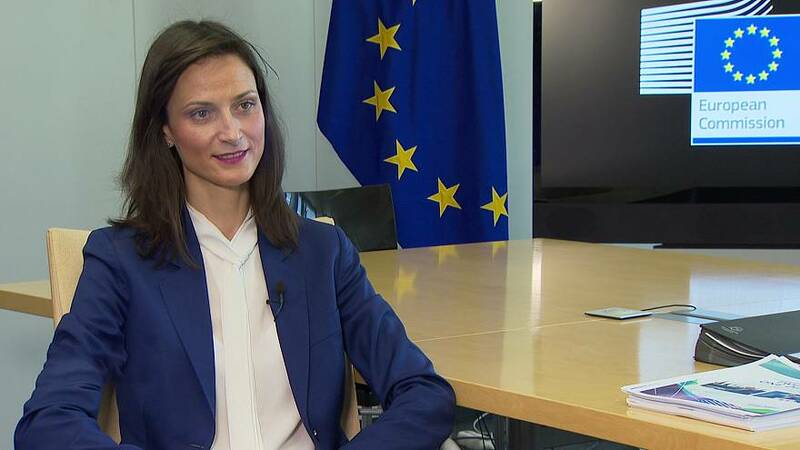 In the European Commission these issues come under the jurisdiction of its Bulgarian Commissioner for Digital Economy and Society, Mariya Gabriel. Her mission is to aid the European digital market, support innovative commerce and ensure network security for businesses and citizens. Mariya Gabriel was our guest on Global Conversation. Where does the European Union stand in the digital market, especially when faced with giants like China and the US? I’d like to start by saying that the world is changing at a faster rate than ever before. Yes, in some areas, such as online platforms, we recognize that we are not quite at the cutting edge. On the other hand, the EU has asserted its leadership in some of the slightly less visible parts of the internet, such as: nano-robotics, security chips and automobiles. Today, the issue is how to use that potential to become a real leader in the digital world while both ensuring the safety of our citizens and creating a global space where we can move forward with our partners. This is where issues arise. One of the first challenges is the mobilization of more investments because if we do not progress in areas where we are not currently at the forefront, it is the result of a lack of investment. That’s why it’s important to us that in the new telecom code, for example, the issues surrounding 5G high-capacity connectivity can be resolved quickly by Member States, in order to have a coordinated approach to and better management of license duration. This way, we can avoid repeating mistakes such as those made with 3G and 4G. Is the goal to create internet giants to rival American companies such as Google and Facebook? No. I don’t think we should waste time trying to copy what others have already done. Let’s focus on our own innovations. We have no more time to lose! We need to accelerate the pace because have tabled 24 legislative initiatives, only six of which are finalized. We must move faster. On the subject of cyber-security, how do you propose to reassure citizens and businesses that their data is protected so that they can surf the internet safely? Cyber threats have no borders. Member States cannot face this challenge alone. Furthermore, something which can have extremely serious consequences is that 80% of European companies claim to have been the victim of a cyber attack in the past year. In September, we proposed some new measures aimed at ensuring that the European Union has a common approach. First, we need to strengthen the European Agency for Cybersecurity. We need a cyber-agency with a permanent mandate, not a temporary one, in order to send a message of stability while working towards our long-term goal. We should also provide it with the necessary budgetary and financial means and give it more operational tasks. Another thing that is close to my heart when talking about cyber-security is our common ability to respond to threats. Today, we don’t have an answer to the question of who does what in the case of a large scale crisis. In September, the Commission proposed that Member States and institutions discuss and agree on the implementation of a European coordination mechanism in the event of a large-scale attack. You also work a lot with social media platforms and the illicit content, hate speech or those who defend terrorism published on them. What can be done? Should we legislate to push the platforms to go further, to act faster? Or should we continue to work with these platforms to remove all this illegal and illicit content? Since we are dealing with phenomena as serious as hate speech, terrorist propaganda and the sexual abuse of children, we must act firmly. This requires dialogue with the platforms first. Through this, we can start to see results. However, today we also have a message to convey. We want the 41 percent of content that stays on the web to disappear. We no longer want content that stays online for longer than a week because analysis shows that the biggest impact occurs in the first two hours after content is published. So, we want to work with platforms to devise a quick and efficient deletion process, while respecting the rules of transparency. So today our message is clear: we would like to intensify our work in order to see more results and also to conduct impact assessments on platforms through dialogue so that we can take another approach if necessary. Another approach… does that mean legislation? Is that what you have in mind? If we don’t feel that sufficient progress has been made my May 2018, we reserve the right to legislate. One of the issues we’re talking about a lot right now is the taxation of internet giants like Google, Facebook and Amazon. these American giants: Google, Facebook, Amazon. What would be a fair and equitable tax for these companies in Europe? If we already had the answer we would not have set the December deadline to do so. So today we sent a signal, it is a question that deserves to be answered. This is an issue that came about as the result of a tax system devised for a very different economy, one that did not know what we know today about the digital world. Today, it is important to answer the question of where is value created on the internet, this is one of the challenges of digitization. It is also a question of justice. For the digital ecosystem and partnerships both inside and outside the European Union to really work and develop, it has to feel as though we are all benefiting. As you have seen, the question has been tabled until December. If they is no progress by then, we reserve the right to act ourselves.